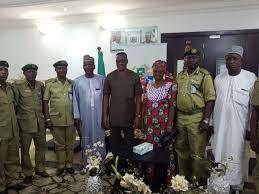 Governor Ahmed pardons twenty prisoners to celebrate Kwara’s fiftieth anniversary – Royal Times of Nigeria. Governor Abdulfatah Ahmed of Kwara State has pardoned 20 inmates serving various jail terms at Oke-Kura and Mandala prisons in Ilorin as part of ongoing 50th anniversary of the state. Six of the inmates who were to die by hanging were granted life imprisonment while one other who was sentenced to life imprisonment had his sentence converted to 21 years imprisonment. Also, another inmate who was jailed on mental ground was released alongside other people who were serving various jail terms for one offence or another. Speaking during anniversary visit to the Oke-kura prison, the governor stressed the need to review prison system in the country, adding that he beliefs that those released would abstain from criminal activities and become model citizens and contribute their quota positively to the society.